It's been 75 degrees the entire time I've been in SF. Don't talk to me about the 400 warm layers I brought before this heat wave descended. I've been living in the only temperature appropriate thing I could find... This leather mini skirt. Yes, it's plastic - but it bells away from the body enough to keep a cool breeze blowing. 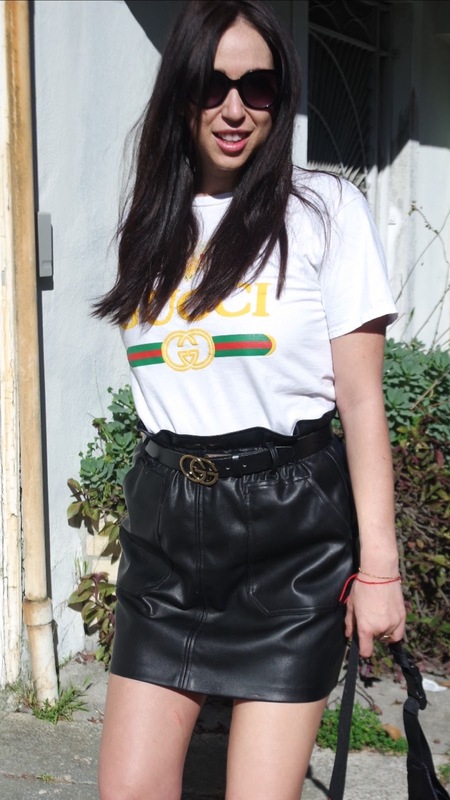 Add a boogie top (in this case bootleg Gucci t from Thailand) and a vintage belt (Gucci Hoochie) and then my vans and boom. I felt a lot cooler than I, well, felt. Also not ready for this weather - my legs. After hacking away at them with a plastic razor I borrow from my mom, all that was left was a splotchy canvas of bruises and skin so translucent I could see my veins. Body Hero to the rescue. See pictures. P.S. Do you know the historical root of the term "boogie." It was not originally "upper middle class" as those who shortened it to it's current incarnation seems to think, interchangeable as it is with Uppity or Fancy. originally and generally, "those who live in the borough", that is to say, the people of the city (including merchants and craftsmen), as opposed to those of rural areas; in this sense, the bourgeoisie began to grow in Europe from the 11th century and particularly during the Renaissance of the 12th century, with the first developments of rural exodus and urbanization. a legally defined class of the Middle Ages to the end of the Ancien Régime (Old Regime) in France, that of inhabitants having the rights of citizenship and political rights in a city (comparable to the German term Bürgertum and Bürger; see also "Burgher"). This bourgeoisie destroyed aristocratic privilege and established civic equality after the French monarchy collapsed. The aristocracy crumbled because it refused to reform institutions and financial systems. a sociologically defined class, especially in contemporary times, referring to people with a certain cultural and financial capital belonging to the middle or upper stratum of the middle class: the upper (haute), middle (moyenne), and petty (petite) bourgeoisie (which are collectively designated "the Bourgeoisie"); an affluent and often opulent stratum of the middle class (capitalist class) who stand opposite the proletariat class. So FYI Boogie can mean affluent, opulent, and uppity - but it can also mean "urban"... Rendering this bootleg t-shirt, Vans, vintage designer, and of course, Supreme fanny pack from ebay, somewhat of an inside joke. This gucci hoochie is boogie boogie. Because like, I was born in a city. BOOM, slapped some knowledge down there.